What is it? Where does it come from? Why don’t most of us know about it? Most of us are well acquainted with aspects of our personality, like being a nice person, an addict, a good employee, the therapist, the hero, the traumatized person, etc. The Authentic Self, however, transcends our personality, thoughts, and emotions. I just love this quote! Shakespeare so wisely understood the importance of tuning in to and following one’s own inner voice, or Authentic Self. Polonius instructed his son to prioritize this “above all” else. The Authentic Self, or Self for short, has the qualities of infinite wisdom, kindness, love, oneness, timelessness, “is-ness”, and acceptance. It is the UNSEEN Self we are born with and will ultimately die with; unchanged through our life’s journey. Our ability to be attuned and aligned with our Self is of paramount importance! In my opinion, this is probably the most important task of our lives. It is the Self that can lead us to the best paths and choices we can make during our lifetime. When our personality is aligned with the wisdom and knowingness of the Self, it becomes a most valuable compass. Unfortunately, we humans have brains that have many “survival” remnants left over from millions of years. These remnants “grab” our attention far more loudly and with much greater intensity than the ever soft, gentle whisper of Self. The manifestation of our Self typically becomes forgotten and turned away from at a very young age. Those of you who have been active in 12-Steps may already be familiar with how dedicated we must be before our connection with Higher Power can be dusted off and revitalized. The “Self” in “To Thine Own Self Be True” is the same; the Self is the portal for Higher Power connection. It is our Authentic Self that should be the compass from which our lives are guided; not just in the big picture, but also in the moment to moment experiences and choices that ultimately become the big picture. What happened with these Authentic Self-qualities that we were born with? I know a few adults who consistently manifest these qualities. Yet, we all did as babies and young children! We couldn’t help but BE those qualities; that was who and what we were! When each of us was born, some parts of our brain began developing and maturing right away, while other parts came “online” more slowly. One of those brain areas that began growing early is the part that enables us to have a sense of ourselves. At about 3 months of age, most humans experience their first dawning awareness that there is a “me”. Before that, we were very well aware of others, aware of interacting with them, etc., but had no real knowing that a “me” existed. Even though this ”me sense” is still quite rudimentary at the tender age of three months, it is nonetheless a huge alarm clock for the ancient survival brain areas. Now that our survival brain recognizes that there is a “me” who is wholly independent of anyone else, this part of our brain has a heyday as it recognizes that it must protect this newly identified person from any harm. These survival brain areas become much more active; now that there is a “me” to protect. These brain areas interpret many more experiences as potentially dangerous. An analogy would be a dog whose family is away, versus that same dog whose family is present. The dog will be far more protective when the family members are present. Our thinking brain continues to grow and mature throughout our early childhood years, leaving us with a more and more complex and sophisticated sense of “me”. Therefore, the survival response becomes intertwined and more often triggered as the definition of “me” grows in complexity and sophistication; there is more of a “me” to protect. What does this “Survival Response” look like? It is usually packaged as a Fight, Flight, or Freeze response. Simply put, some areas of our very ancient brain signal other brain areas to release adrenaline and other chemicals to mobilize our body into quick and intense behaviors, like fleeing, fighting, etc. At the same time, there are electrical signals supporting these fight, flight and freeze responses, as well as hormonal responses that try to sustain these survival responses, like cortisol. All said, with the electrical, neurochemical, and hormonal activity, a person quickly becomes overrun with the physical and emotional responses to the Fight, Flight, Freeze activity. This activity feels quite uncomfortable to us. Just think of the last time you had a “close call” with something, like a near-miss car accident, and your heart was racing, and you had rapid breathing, shaking, emotionally feeling fear, etc. If these kinds of physiologic responses occur often, they can be very uncomfortable for us. When we are very young, our minds try their best to decrease these Fight, Flight, Freeze responses. When we are little children, our thinking brain is one of those brain areas that take much longer to develop when compared to the survival brain areas. Therefore, we simply don’t understand much of what is going on around us, or why our caregivers are responding to us the way they do. This “not knowing” is a perfect setup for us to misinterpret the meaning of their behaviors and interactions with us. Our little imaginations can run wild and come to very erroneous conclusions. Many, therefore, of our misunderstandings of our caregiver’s actions can lead to these Fight, Flight, Freeze responses. Aristotle and Sigmund Freud had described the pain-pleasure principle. Basically, this explains that human beings are “wired” to both moves away from pain, and go towards pleasure. When we were young children and our survival brains were triggering the Fight, Flight, Freeze responses, we would be left feeling quite uncomfortable. The Fight, Flight, Freeze responses are VERY stressful on the body and our emotional state. We start making up “rules of life” of how to keep our parents and other important people happy with us. There are potentially thousands of these “rules”. The purpose of them is to navigate our lives more successfully with our caregivers and to decrease the frequency of FFF response. Now, these aren’t rules like we create when we are older and think and analyze things in our thinking brain; rather, these are safety strategies that our survival brain creates. These rules are the ones that are tightly bound with Fight, Flight, Freeze responses. For example, the deep false belief “I shouldn’t get angry” often develops when a child is young and becomes very angry or rageful about someone or something. This is a totally normal reaction. When the child, however, sees the negative facial expression or reaction of their psychologically extremely important parents, the child may instantly go into an FFF reaction. After a few to several experiences like this, in order to avoid the powerful FFF bodily and emotional experience, the child’s relatively undeveloped thinking brain will figure out something like “Uh-oh, Mom looks like she doesn’t love me when I’m angry. I better stop it or I might lose her love.” Eventually, this belief may become something like: “I’m bad when I’m angry”. Parallel to this ongoing process of our young brains making up these deep false beliefs, our personality is evolving and developing. Since survival responses “trump” all other brain wirings, including personality development, our personalities have to grow through and around these many deep false beliefs. Therefore, our personalities that we hold near and dear to us are actually products from having been heavily influenced by all of these “rules”. For example, our personality may be very “nice”. It’s important to ultimately understand what aspects of ourselves are authentic and genuine, versus a response to deep false beliefs. By the time we are beginning school, most of us have layers of deep false beliefs that are meshed together with our personalities. We have lost touch with much of our Authentic Self. Is our Authentic Self-gone or contaminated or pared down? No! It remains quietly present, usually without your awareness of it. In general, the “voice” of our conscious thinking brain and deep false beliefs are far louder than the “voice” (whisper) of the Authentic Self. What happens when a child has a deeply embedded deep false belief, like “Whatever I do, I better do well!”? We form many, many expectations of others and ourselves from this one deep false belief. For example, the expectation of great school performance, or sports performance, etc., may become offshoots of the deep false belief of “Whatever I do, I better do well”. These expectations may become offshoots of the Deep False Belief “whatever I do, I better do well.” And remember that the Deep False Beliefs and expectations are bound together with the FFF responses. So that when we don’t perform well at school, that deep survival brain response will become triggered. Notice that this in different than our usual desire to do well at school; this FEELS within our body and emotion that we MUST perform well at school. A personal example of this recently happened to me. I had been raised by parents who deeply valued academic performance. I would shudder when looking in their faces when I would bring home a “not so great” report card. At a young age, my brain created the Deep False Belief that went something like: “I better do well at school or Mom and Dad will be very unhappy with me.” My survival brain was clearly tied to this, as my body would go into terror (Flight mode), whenever I would bring home a poor report card. That was many years ago. Cut ahead to several weeks ago: I took a quiz in Oprah Magazine that tested the reader’s clothing IQ. Even though I have little to no interest in this area, I found my heart racing, respirations increasing, and my hands trembling a bit when I tallied up my score and found I had badly failed the quiz! This demonstrated that our Deep False Beliefs become deeply embedded in our psyche, and are tightly bound to our survival brain’s FFF response. Other examples could be our performance in sports, a musical instrument, “looking right”, driving the right car, and so forth. How many expectations could be spin-offs of the one “Whatever I do, I better do well”? I would guesstimate thousands. I once tracked my thoughts for a whole day. Aside from being incredibly boring, I was amazed to find that I had expectations to do well with many, many things! For example how well I brushed my teeth if I ate right for breakfast if I drove too fast or slow. Most of us have thousands of deep false beliefs, and many of those have thousands of expectations that offshoot from the belief. I think we’re looking at a vast amount of expectations that are stored within each of us! 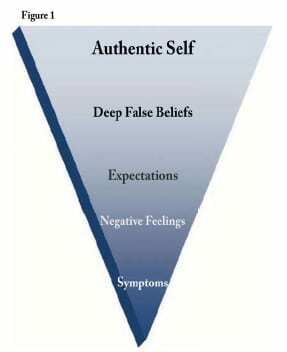 Again, what is happening with our Authentic Self as our mind/brain are inundated with expectations? We move farther and farther away. By the time we reach the mid-adulthood years, many of us find we are not reaching an increasing number of our expectations that were put into place many years before. For example, we find that we simply cannot do many things well. Or we may find that we cannot perform so well in sports anymore. Or that our marriages just didn’t work out as we had expected, etc. If we look at the flowchart in Figure 1, we see that negative feelings may follow when our expectations are not met. Research has clearly shown that when a person harbors negative feelings for longer than a short period of time, i.e., anger, sadness, fear, our bodies “take a hit”; our immune function, heart function, resistance to cancer, heart disease, etc may become compromised. Finally, we then fall to the very bottom of the flowchart, which is when we develop symptoms. This could be depression, anxiety, certain medical problems, etc. By the time we are adults, most of us have brains and nervous systems that are inundated with deep false beliefs, expectations, and Fight, Flight, Freeze responses. Our true Self is typically long forgotten about. It would be challenging to follow “To Thine Own Self Be True” simply because most of us are unaware of who the Self is. 2. work on the highest levels as possible on the flowchart. If you’re stuck down in “symptoms” level of the flowchart, e.g., chronic depression, anxiety, etc., and your current sole strategy is to take your prescribed medication (which only addresses the bottom level of the Flow Chart), you may feel better for awhile, but you still have the same batch of Deep False Beliefs and expectations lodged in your psyche. It may just be a matter of time before more of our expectations from Deep False Beliefs are not met, and fall down the flowchart into having symptoms again. In addition to taking your medication, you might also consider spiritual practice, like a 12-Step program, and/ or meditation or other mindfulness practice, and/or connecting with nature, or whatever brings you closer to your Authentic Self. These interventions would be working at the top level of the flowchart. Additionally, anything that stabilizes the brainstem and limbic areas of our brain will generally lead to greater calm and relaxation. This will automatically make us more available to connect with our Authentic Self. Some examples: Mindfulness practices, slow-paced yoga, Emotional Freedom Technique, acupuncture, neurofeedback, Heart Rate Variability training, Somatic Experiencing, Sensorimotor Psychotherapy, and many more. The next very potent level of intervening in order to re-acquaint you with your Authentic Self could be identifying and correcting Deep False Beliefs. There are many ways to do this. Having a therapist initially could really speed up the process until you can do it more on your own. Therapists or books with cognitive approaches can assist you to identify your Deep False Beliefs, and techniques like EMDR (Eye Movement Desensitization an Reprocessing), IFS (Internal Family systems (Richard Schwartz, founder), can help you clear them out. Now, why do you think we would get a “bigger bang for the buck” with clearing deep false beliefs, over expectations? Both approaches are actually fine, however, when you identify and pull up by the roots even one large Deep False Belief, many, many expectations are simultaneously uprooted. So one Deep False Belief, like “Whatever I do, I better do well!”, can have thousands of expectations that are offshoots. Many of them will disappear when the underlying belief is corrected. If you had approached the process by mainly identifying and clearing out your expectations, although this is very good, it is much more tedious work, and may not clear out the underlying Deep False Belief, that may continue to generate additional Expectations. Some interventions work at all levels of the flowchart. For example, the 5-day Survivors workshop at The Meadows addresses all levels of the flowchart. Whatever approach you choose to take in reclaiming your Authentic Self, just keep in mind WHERE on the chart you are working. This will help you over the long run to maximize your connection with Authentic Self. Dr. Shelley Uram is a Harvard trained, triple board-certified psychiatrist and a Distinguished Fellow of the American Academy of Child & Adolescent Psychiatry. She speaks around the world about psychological trauma, and how it often interferes with our ability to thrive in life. She is best known for communicating very complex information in an interesting and easy to understand manner. Dr. Uram is a Senior Fellow at The Meadows, where she teaches patients and staff and assists with program development. She is also a Clinical Associate Professor of Psychiatry at The University of Arizona College of Medicine.